The leadership role for improving commuter options can range from the Human Resources, Health & Wellness, or Sustainability Manager to an employee green committee or health and wellness committee. The most effective commuter option programs engage both management and employees, often those who are already keen cyclists, walkers, and transit riders, in planning and implementing improvements. Examples of supportive policies include a compressed workweek, flexible work start and end times, telecommuting, casual dress code, or preferential parking for carpoolers. Offer a limited number of free or subsidized rides to employees who walk, bike, bus or carpool to work with an Emergency Ride Home program. Replace subsidized parking with a monthly transportation allowance, which employees can apply towards whatever form of commuting they choose. Good facilities at the workplace make it easier for employees to choose to bus, carpool, walk or bike to work. 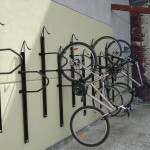 Examples of infrastructure include secure bike parking, showers, lockers, change rooms, on-site bike fleet, and premium parking spots for carpoolers. When choosing a site location, consider such factors as transit service levels, walking proximity to amenities such as restaurants, shopping, banking and daycares, and the degree of bike- and pedestrian-friendliness of the area, and make them a priority whenever possible. Actively communicate and promote your workplace’s policies, programs, benefits and infrastructure. Make sure all of your employees are aware of their commuting options – make it part of your recruiting program and orientation for new employees. Examples of tools to keep employees informed include posting a commuting board on your Intranet site if available; email bulletins or internal newsletters; posters on bulletin boards in common use areas; and participation in motivational events such as the annual Commuter Challenge and Bike to Work Day. Consider creating your own workplace events throughout the year to encourage employees to try walking, cycling, carpooling or transit and reward those who do. Green Action Centre offers the Smart Trips program, which has proven effective in supporting and encouraging employees to make sustained changes in how they get to work. Talk to us about running this type of program at your workplace. create and implement an ongoing tracking program. Get recognized for your role as a corporate environmental leader. 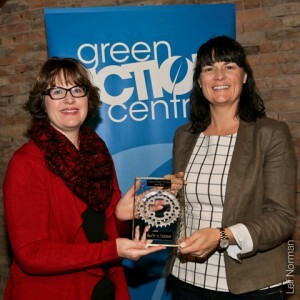 Green Action Centre’s Commuter Friendly Workplace Award program recognizes Manitoba workplaces that offer exceptional commuter options programs for employees. 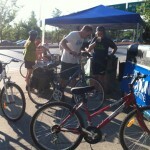 LET GREEN ACTION CENTRE’S WORKPLACE COMMUTER OPTIONS PROGRAM HELP MAKE YOUR WORKPLACE COMMUTER FRIENDLY!